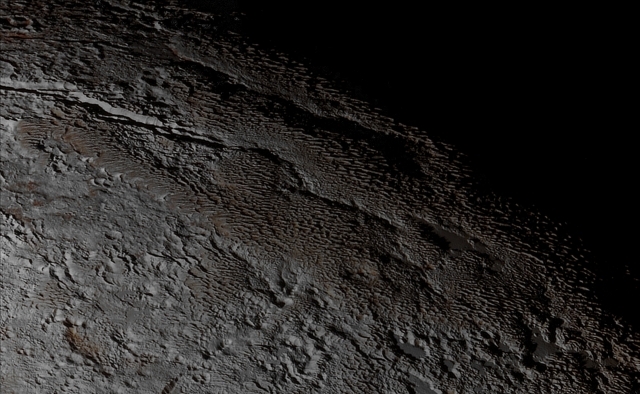 In this deeply suggestive Contextual Image of the Dwarf Planet Pluto, taken by the NASA - New Horizons Spacecraft on July, 14,2015, we can see, all around a deep and sinuous Canyon which cuts the entire landscape, some rounded and bizarrely textured Mountains - so far informally named "Tartarus Dorsa" - which rise up along Pluto's Terminator Line and show intricate and puzzling patterns of pale blue-gray Ridges and orangish (and unknown, perhaps Sandy or Dusty) Material in between. This view, roughly 330 miles (such as about 531,0822 Km) across, combines - in its Original Version - blue, red and InfraRed images which were all taken by the Ralph/Multispectral Visual Imaging Camera (or "MVIC", for short) located onboard the NASA - New Horizons Spacecraft, and resolves Surface Details and Colors on scales as small as approx. 0,8 miles (such as about 1,2874 Km) per Picture Element (---> pixel). The image (which is an Original NASA - New Horizons Spacecraft's falsely colored and NON Map-Projected frame published on the NASA - Planetary Photojournal with the ID n. 19957) has been additionally processed, magnified to aid the visibility of the details, contrast enhanced and sharpened, Gamma corrected and then re-colorized (according to an educated guess carried out by Dr Paolo C. Fienga-LXTT-IPF) in Absolute Natural Colors (such as the colors that a normal human eye would actually perceive if someone were onboard the NASA - New Horizons Spacecraft and then looked outside, towards the Dwarf-Planet Pluto), by using an original technique created - and, in time, dramatically improved - by the Lunar Explorer Italia Team.